A delightful line drawing of Green Tara by the master of Tibetan arts Sherab Palden Beru. The above image shows a 'prayer flag' of Green Tara, who is surrounded by a longer prayer called the '21 Praises of Tara'. 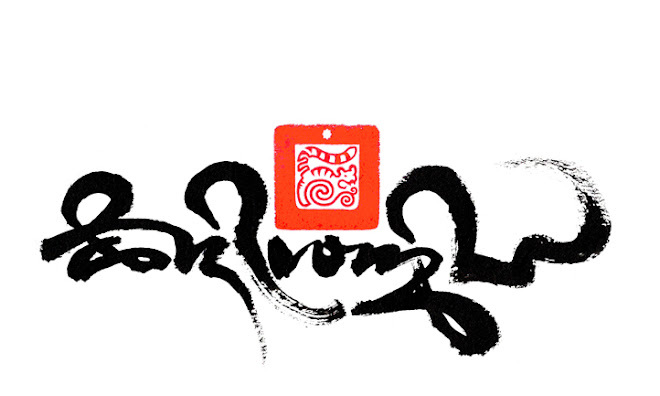 It is one of the first calligraphy pieces created by Tashi when he was a novice monk during the 1980's. The beautiful line drawing of Tara was the initial inspiration to create the prayer flag, placing the image of Tara as the centre piece of this invocation prayer. The seed syllable Tam of Green Tara, here seated on an open lotus flower. This short supplication prayer to Tara that can be repeated much like a mantra, normally recited many times over at the end of the 21 praises and before the actual mantra of Tara, shown below. Protect me from fear and suffering. 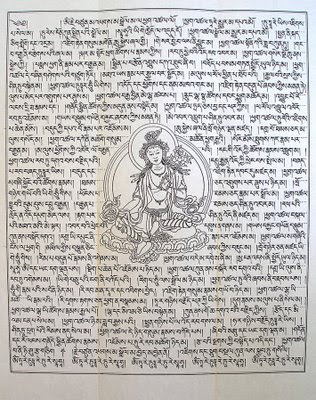 'Jetsun Pagma Drolma' is the Tibetan name of green Tara. 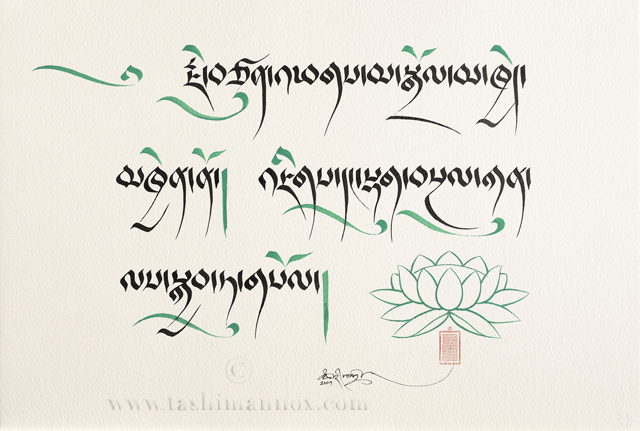 The above calligraphy called 'Green Tara Prayer' by Tashi Mannox is also available as beautiful limited addition prints in two sizes, if you are interested in ordering a print you may find more information here. 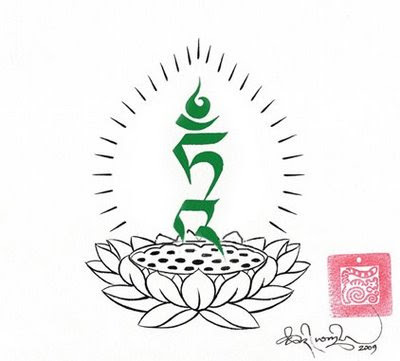 This Green Tara mantra is available in many of the different Tibetan script styles as well as Tara's 'tam' syllable on lotus design on the new Tashi Mannox store. Mangalam.... May everything be Auspicious !! A shrine at the London Samye Dzong Buddhist centre. decoration design by Tashi Mannox 2007-09, applied gold and silver leaf. The Five Buddha families also known in Sanskrit as the Five Dhyani Buddhas, traditionally take pride of place in their many representations, in Mandala paintings to decorative embellishments on shrines, (such as the image above and below) They make take form simply as their respective seed syllable representation or as a full set 3D Buddha statue images, depicted in their own colours, symbolic emblems, hand gestures Mudra and animal throne, all representative of each of their individual wisdom quality. Detail of central shrine canopy decoration. 1. Om, center, Virochana Buddha. 2. Hum, East, Akshobya Buddha. 3. Tram, south, Ratnasambhava Buddha. 4. Hri, West, Amitabha Buddha. 5. Ah, North, Amoghasiddhi Buddha. For more explanation on the symbolism and meaning of the Five Buddha families visit here. 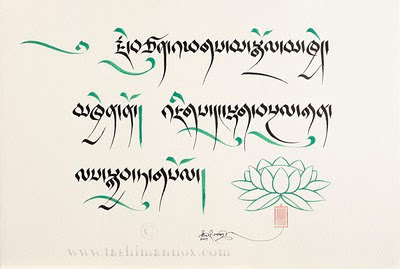 Calligraphy of the five Buddha lotus mandala, Tashi Mannox 2009. The Five Buddhas form a base of a Mandala, the above lotus mandala shows each of the Buddhas seed syllables in the Lanza Sanskrit, Om at the central point, Hum below in the Eastern quarter, arranged around clockwise, following the suns path, are Tram, Hri and Ah. 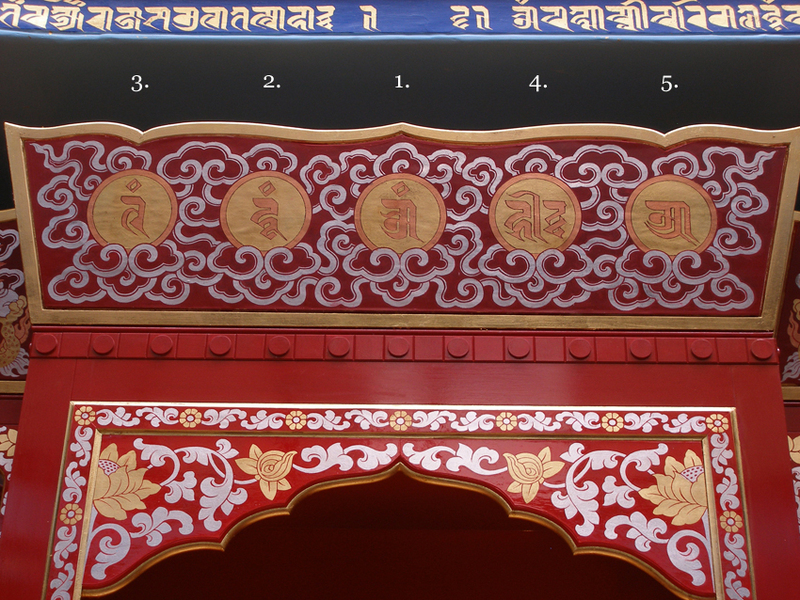 There is variation in representation of place and colour relating to the directions, for example the Om and hum can be switched, the examples shown here are according to the Tibetan Buddhist Tradition. When writing the syllables normally from left to right, they follow in their respected order: Om, hum, Tram, Hri, Ah, as shown below. 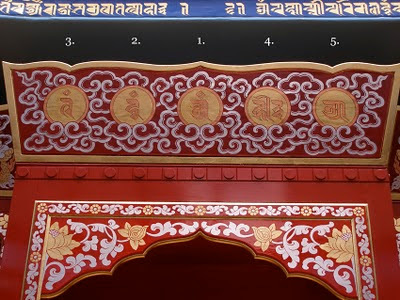 However when relating each of these letters to their assigned central and cardinal directions, the order is changed, This is apparent in the Five Buddha crown shown below and on the shrine canopy above. 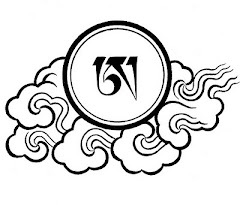 The five Buddha crown, known as rig nga in Tibetan, here represented in the Uchen script style. Hand made by Tashi Mannox 2008. 1. Om, Virochana, Buddha family. Ignorance converts to all accommodating wisdom. 2. Hum, Akshobya, Vajra Buddha family. Hate/anger converts to mirror like wisdom. 3. Tram, Ratnasambhava Jewel Buddha family. Greed/pride converts to equanimity equality wisdom. 4. Hri, Amitabha, Lotus Buddha family. Desire converts to discriminating wisdom. 5. Ah, Amoghasiddhi, Karma Buddha family. Envy converts to all accomplishing wisdom. Click here for a more detailed explanation by Ven Thrangu Rinpoche.